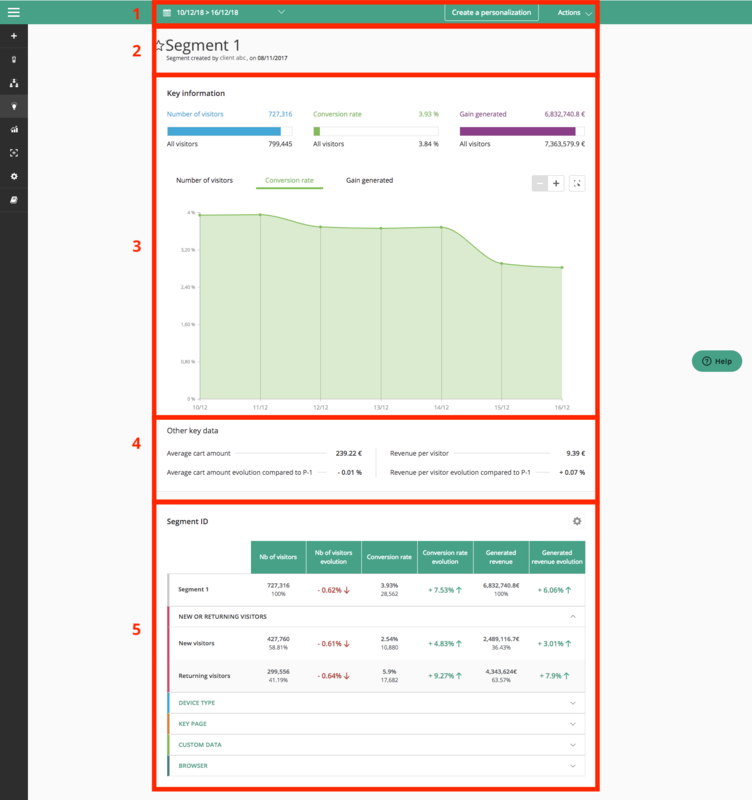 The Segment page offers you to visualize and analyze in detail the segments displayed on the Insights page. You can access it from Insights. In the table at the bottom of the page, click on a segment; a menu appears; click on “See more details on this segment” to access the page. For further information on the structure of the page, please read our article on the subject. To know how to access it, please read this article. Header: the selected date range, a button to create a personalization targeting the segment, and the action menu (export, share, print). Identity of the segment: its name and date of creation. Key information: three gauges presenting the number of visitors, the conversion rate and the gain generated, expressed in comparison to all visitors; a graph presenting to these data. Other key data: the average cart amount and its evolution compared to P-1 (the previous period, depending on the date range chosen in the header), the revenue per visitor and its evolution compared to P-1. Segment ID: in the form of foldable tables, the data associated with the segment, broken down by targeting condition. To learn more about the data presented on the Segment page, please consult our detailed documentation. By default, the audience analysis displayed on the page corresponds to yesterday’s traffic. You can change this setting with one click to view results for the last week, last two weeks, or last month. This has an effect on all the data on the page. Click the button to display the personalization creation pop-in. Fill in the requested information and confirm: you are redirected to the personalization page. An “Audiences” tag is automatically associated with the experiment and the segment from which you have just configured the personalization is entered by default as an exposed segment. To learn more about configuring a personalization, please read our documentation on the subject. Pull down the menu to access the actions: “Export in PDF”, “Share URL” and “Print”. You can also share the page URL to give your collaborators access to the detailed data of a segment. A YES/NO switch button allows you to share this URL with a password: access to this page from the share link will be secure. Set the password by entering it in the text area. By clicking “Copy and close”, the URL is automatically copied to the clipboard. The page thus shared only allows consultation and does not give access to the editing options or the various actions. If you click on “Print”, the page will be printed as it appears in a PDF export. If the segment has not been added to favorites, the star is empty; if it has been, the star is full. To add a segment to favorites (or remove it from the list), just click on the star. This is a segment predefined by Kameleoon. More information on the segment is gathered here, in the form of three gauges and three graphs. On hover, you can display the exact number of visitors included in the segment, as well as the portion they represent in relation to the total audience. Visually, this data is also represented by the ratio between the blue zone (number of visitors included in the segment, here 2,099,283) and the gauge (total number of visitors, here 2,223,261). The conversion rate is indicated in the same way as the previous gauge. This gauge represents the income generated by the visitors included in the segment in relation to the income generated by all visitors. On hover, the portion represented by the segment appears. The graphs present the evolution of the key information: evolution of the size of the segment, evolution of the conversion rate and evolution of the gain generated. The colors are the same as those of the previous zone so you can easily identify the data. Navigate between the tabs to view the three curves. On hover on each curve, the data is displayed. You can also zoom in on the graph or a portion of it to see more precisely the evolution of the curve. The revenue per visitor evolution compared to the previous period. The data therefore depends on the period you have selected in the header. If the date range is set on the last week, the evolution is compared to the week before; if it is set on the last month, is is compared to the month before; etc. Evolution can be positive, negative or neutral. The Segment ID block collects some key data (number of visitors, conversion rate, time spent on your site and generated revenue), broken down by targeting condition. These figures are compared to those of the previous period. Audiences indicates you whether the evolution has been positive or negative . Click on the wheel at the top right of the block on to scroll down the settings menu. You have three options: choose the columns to display, choose the targeting conditions to display, or just fold/unfold (make all columns and conditions appear or disappear, but there can not be less than one). In the first two options, check and uncheck the boxes to customize the display of the table. You can not view more than 6 columns at a time, so you are never facing an unreadable extensive table. Targeting conditions are used to break up segment data. You can choose which targeting conditions you want to display using the settings menu . To learn more about the targeting conditions, see our documentation. The first row of the table presents the data for the whole segment. By default, only the first targeting condition is unfolded. By clicking on the following via the arrow, you display the associated lines; clicking again will rewind the line . Some targeting conditions have numbers and percentages, and others tell you how the period has changed from the previous period. This evolution is represented by an arrow (red for decrease, green for increase).